Ti è mai capitato di dover trascorrere del tempo con un collega straniero senza essere esattamente in grado di colmare il silenzio? Sapere come intavolare una conversazione in inglese con conoscenti o perfetti sconosciuti è il primo passo per non incappare in situazioni di mutismo imbarazzante. 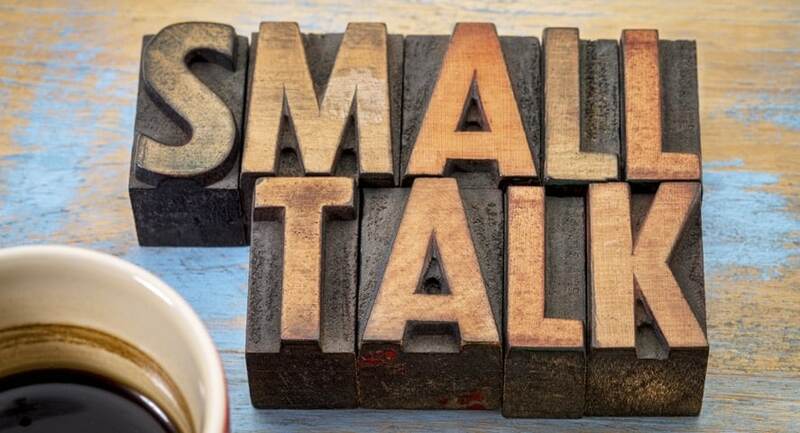 Esempi di Small Talk, cioè chiacchierate “di poco conto”, conversazioni di circostanza per parlare del più e del meno, vi aiuteranno a rompere il ghiaccio, a ridurre le distanze interpersonali e a mostrare interesse verso il prossimo. Today the weather seems really good, isn’t that beautiful? This morning it feels very cold, don’t you think? I wish I didn’t have to come to work today, it’s so nice out there! What about you? Do you think it’s going to rain today? The forecast said it would be sunny, but it’s so cloudy! Do you think that a team from (country) will win the Champion’s League this year? How are you finding your new job? Do you live far away from the office? Do you drive? Do you take the train? Are you attending the meeting on Wednesday? Where do you normally have lunch? At the canteen? At the bar? Do you bring your own food? How was your evening? Was it good? Did you watch that film on TV? Are you watching this new series on Netflix? What do you think about it? Did you watch the news last night? Did you hear about the strike? Are there any places you would recommend worth visiting? Where are you planning to go next summer? I love your necklace, where did you buy it? Was it a present? Where is the shop? Have you had a haircut? I love your new look, it really suits you. Where did you have it done? Have you met the new person working in Marketing? I believe he is from Spain. That’s a lovely ringtone, what song is it? Luisa Romano is an English teacher, born and raised in UK. Her parents are Italian, hence her fluency in 2 languages. She started teaching in 2003 as a hobby, soon she realised how much she loved it and decided to give up her office job to fully concentrate herself on the teaching career. Luisa moved to Rome in 2013, she needed a change and above all the Italian sunshine. As a freelance English Teacher, she joined Speexx in 2013 and she has been involved not only in teaching online and face2face but also in various projects such as proofreading and content creation.